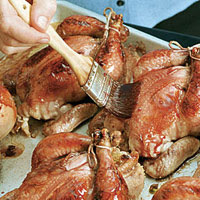 This glaze gives a beautiful, burnished sheen that makes a stuffed bird even more special. It's also delicious on plain, unstuffed birds. In a small saucepan, boil the apple juice until reduced to 1/2 cup. Add the remaining ingredients and return to a boil. Reduce to a simmer and cook until reduced to 3/4 cup, about 3 minutes. This entry was posted on 2:28 AM and is filed under Sauces . You can follow any responses to this entry through the RSS 2.0 feed. You can leave a response, or trackback from your own site.